What better way to honor Dr. Seuss' birthday than to participate in a READ ACROSS AMERICA event at friend Steve Evangelista's charter school, Harlem Links! Steve found me last year through my grandmother's website, and came to a few writing workshops that I was leading at Morningside Bookstore on the Upper West Side (including a workshop based on A Wrinkle in Time.) He then invited me to come and share my love of reading with some other writers and board members of his school. We were greeted by coffee and muffins, and had a chance to schmooze with some of the other guests. This was followed by each pair of guest readers sitting at a table with four "ambassador" students. Elizabeth and I were at a table with four fifth graders who were eager to be read to. One girl remembered me from last year, and that I had read The Lorax to her fourth grade class. Would I read it again? You bet! Elizabeth and I developed a great rhythm together with the kids: I read and paused at certain places, and we would raise questions about character and plot. Next up: Elizabeth and I went to different classrooms for a read-aloud and a Q&A. Elizabeth brought her book, Squashed In the Middle to read. 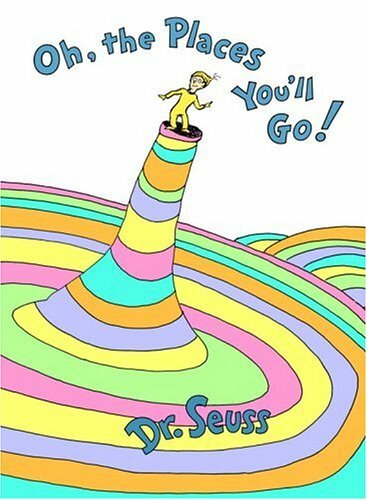 I asked my two ambassadors to choose a book for me, and they picked my favorite: Oh, the Places You'll Go! The kids brought me up to their classroom and set up a chair for me, even offering me water and going so far as getting me a peppermint! I enjoy reading aloud immensely - and this was no different. The children were attentive and appreciative, but it was the Q & A that blew me away: so much curiosity and sharp intelligence about the writing process! I could have stayed much longer and schmoozed with them, but alas, they had the rest of the school day, and other things to learn. Courtney and I met afterward for lunch in the neighborhood. We compared notes on a wonderful, enriching morning, feeling grateful to have our opportunities in the literary world, and the chance to enthuse young readers about books. Next post: Thursday, March 4th - another Writers for Writers lunch! Even so, as long as they include on the net good friends who definitely are from other Twitter bank account to enhance some sort of goods and services they will view the advertising and find this goods useful. However they will go to the hyperlink to a online store web page in addition to contemplate generating a acquire. Even so, pop up ads health care need to be considered as soon as promotion on the net. Inbound links on your online store web page alone page usually are tolerable although positioning reviews while using the similar web page link with different members’ internet websites shall be thought to be junk mail by means of both the different customers along with the Twitter directors. Together with advertising product or service, Twitter internet websites they can double for the purpose of self applied marketing and advertising. Products, personalities in addition to stars, artists along with musicians and singers are extremely acknowledging this likelihood of self applied marketing and advertising which often prevails with Twitter. Customers on the group can incorporate every little thing which is often employed to these who would like to seek the services of these individuals sometime soon.